capacity (X,Y,Z) 15.7" 11.8" 8.7"
wire diameters .004" to .012"
With the perfect balance of speed and accuracy, our new Wire EDM machine represents the latest and best in machining technology. This investment will help us maintain our competetive edge in performance and efficiency, to the benefit of our customers. 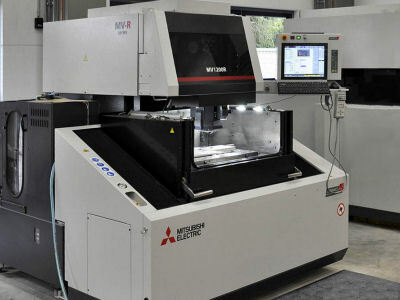 Technical improvements on this model result in substantially faster cutting speeds, an optical drive system gives exceptionally precise positioning and the innovative work table design improves the achievable surface finish. Improvements to our production capacity and productivity are always reflected in our very competitive prices and short lead times. Check us out for a quote. Our proficiency in high-tech tooling, superior training and good old fashioned craftsmanship works for the advantage of manufacturing companies worldwide.